So I had a little computer problem that prevented me from posting. But fortunately Gorgeous Man had a work trip to Australia last week and has returned with a lovely new computer for me, so I’m back in business. (You can buy computers in Papua New Guinea, but they tend to be much more expensive than buying in Australia and so since he had to be there anyway I decided to wait a few weeks for my replacement). 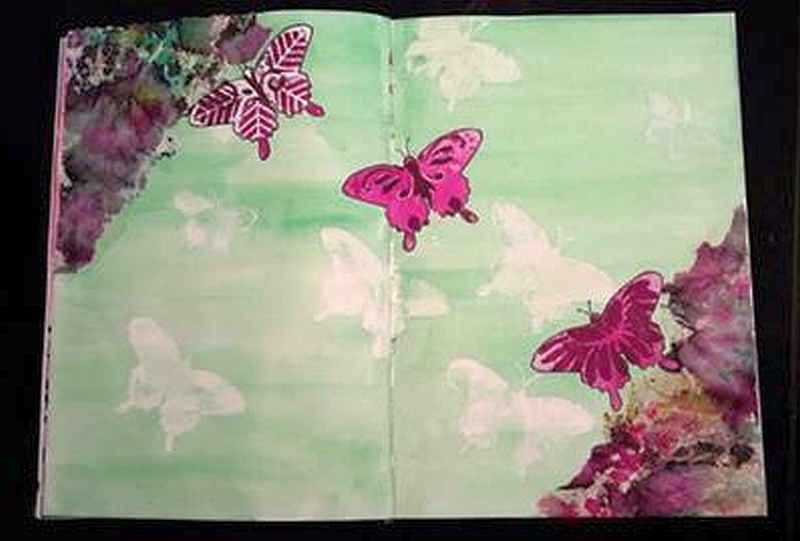 A few months ago I painted one of the pages in my journal black. While I was doing research in the USA I had most evenings to myself and so had time to play around with it. 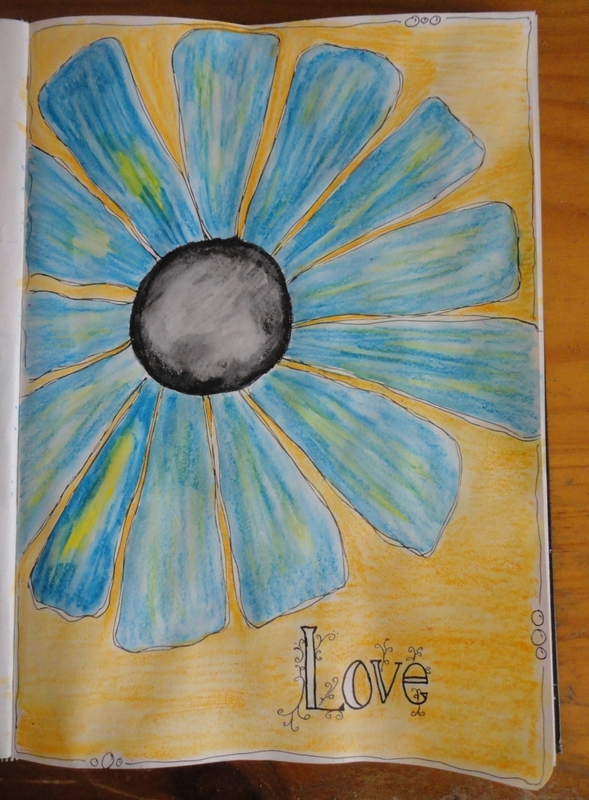 This doodling was inspired by Alisa Burke who creates wonderful art. I’m rather pleased with this. One thing I have committed to this year is to spend one evening a week actually trying something from the many myriad of pins I’ve pinned on pinterest. It’s been great and I can feel my sewing mojo returning. Pictures of those projects in a future post or two. My paper crafting mojo has pretty much disappeared this year, but I did have a brief flash of inspiration recently. 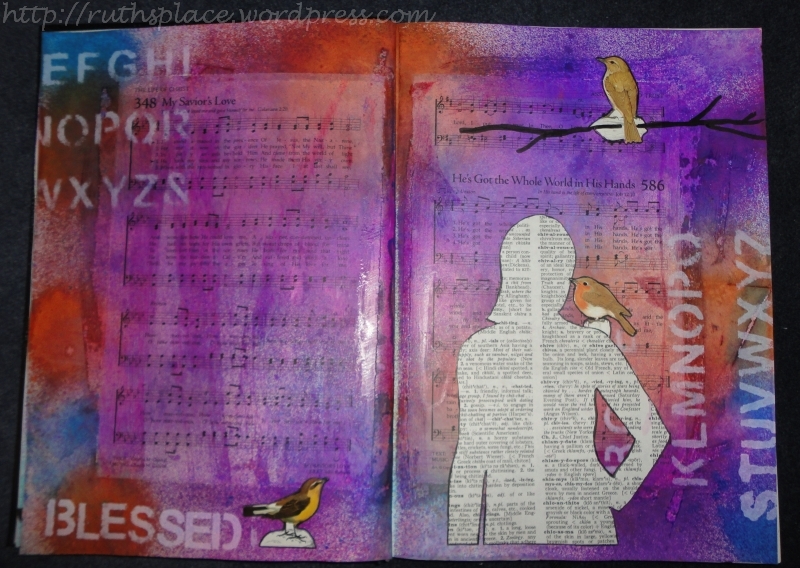 This is my first solo art journalling attempt since taking classes with my very talented sister-in-law. I think acrylic paints instead of water colours would work better for the backgrounds. I stenciled the roof. Background is a google map that I used to find my way in Hong Kong a few years ago. I saved it at the time for an art journal background. On this page it’s an old book and some old sheet music. I’m kinda sorta happy with it. The pages done in class are much nicer. I think I need to add some trees and perhaps some small flowers. I’ve been really stalled with playing in my art journal because I am intimidated by the huge expanse of white on a double page spread. Last night it occurred to me that I could do a single page. There was no rule that said I had to fill both pages. (Yeah, I’m a bit slow on the uptake sometimes…). So while chatting with my brother via facebook I got out my pencil and set to work. I was inspired by an image I pinned from Totally Tracy. 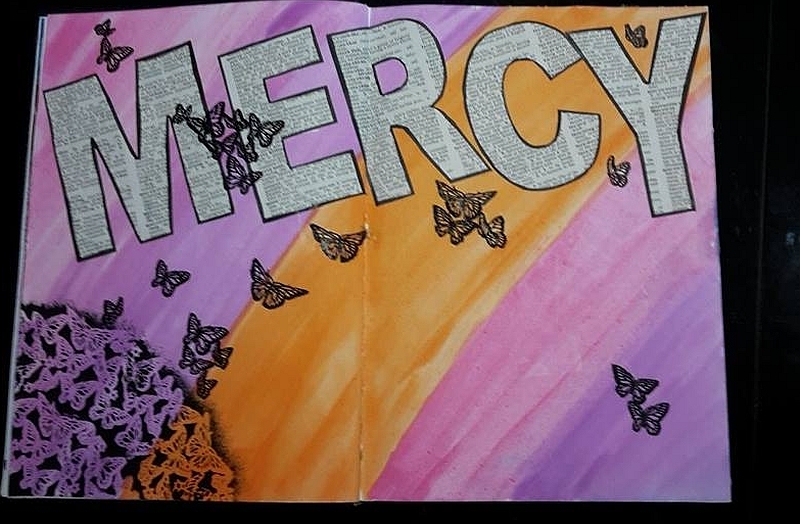 This is how my page turned out. I’m happy with how it turned out and I’m tossing up ideas for a similar yet different page to go opposite it. So I’m still in Australia waiting for my visa. Therefore I took the opportunity to attend another art jounalling class with Rochelle. Once again she managed to help the group of us complete (or almost complete) 2 double page spreads. Colours are hard to truly capture. It’s more green in real life. This will have some words added at some point. If I was doing this again I’d sketch in pencil lines to make sure that my background colours radiated a little better. I’m happy with how these turned out. It was lovely seeing everyone’s interpretation of the techniques and inspiration pages. If I’m still in Australia next well I’ll go to the next class. I’m trying to take advantage of my time in Australia and do some things that I can’t do in PNG. 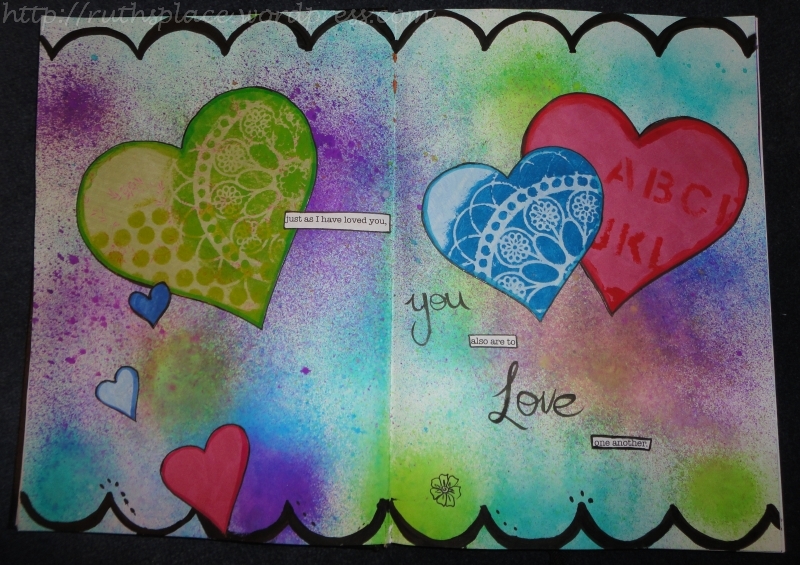 So today I went to an art journalling class run by my very talented sister-in-law. We made two double page spreads. It was really interesting to see how each person’s work turned out completely individually even though the same materials were used by everyone. Watching other people work also gave me ideas that I can use when I’m on my own. This is the first page we did. I’m much happier with this spread. The little birds were part of a care package from Kate. I drew the branch in free hand. I think the page may need a little more on the left. But I’m going to cogitate on that for a while. I know I’ve got a long way to go with my pages, but I learned some new things today and got a little more confidence to break out on my own. If I’m still in Australia next week I’ll go to the next class and learn some more.